The infographic below is a first attempt to map the pathway to care for transgender/transsexual Jersey residents seeking to transition. It is based on personal testimonies of islanders who have transitioned and, due to the confusing nature of the system at present, may not match your experience. Please email us if you think you can contribute to our findings. Apart from cost, the main difference between the public and private routes to care is choice of practitioner and speed. There are set procedures that the public system have to follow when treating trans* patients that include statutory waiting times where the patient must live as their preferred gender before being permitted hormone therapy and/or surgery. These waiting times, largely, fall away when going the private route. 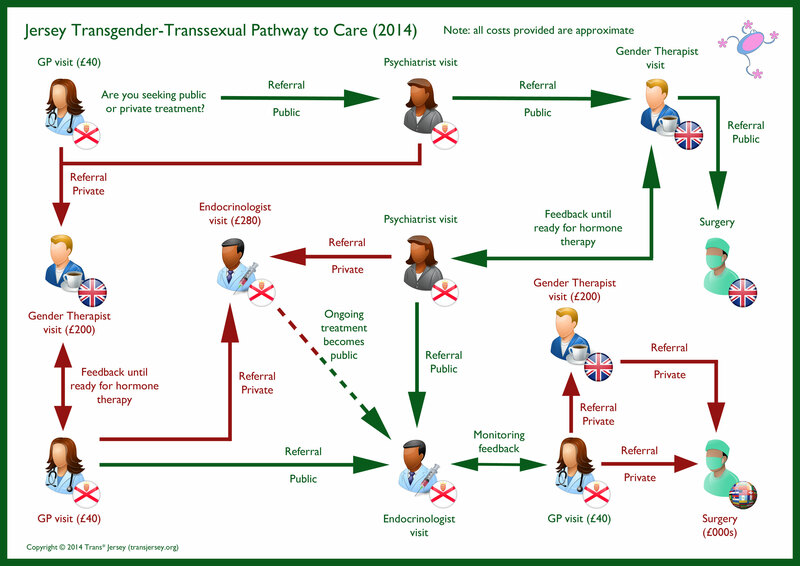 Trans* Jersey is working to clarify the pathway below with the States of Jersey Health and Social Services Department. The question of funding is particularly unclear.